Monkfish liver has been eaten in Japan for centuries, and can be found in some Japanese restaurants in the U.S. 'Monkfish Foi Gras' has the same texture as goose liver pate. Monkfish are found in the Atlantic Ocean and the Mediterranean Sea. 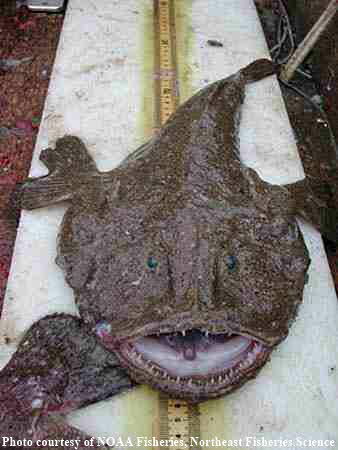 Monkfish, also known as a anglerfish, frogfish, goosefish, and sea devil, is a very ugly fish, with a huge head and large teeth. Monkfish are almost all head, and most of their head is mouth - with fang like teeth, They have been known to catch and eat waterbirds at the surface. Generally only monkfish tail is eaten, which has a sweet, lobster-like flavor. Monkfish tail fillets can weigh up to 10 pounds.